President Obama shows that insurance rebate checks are in the mail. Republicans in the U.S. House of Representatives have been at it again. Over the past two weeks Speaker John Boehner (R-OH) and Majority Leader Eric Cantor (R-VA), along with their happy band of miscreants, have voted not once, but twice, to again try and remove certain binding provisions of President Obama’s sweeping healthcare reform law. Each vote passed the House overwhelmingly. The problem for Republicans is the Affordable Care Act has already successfully navigated both houses of Congress, was signed into law, and validated by the U.S. Supreme Court. It doesn’t matter what this current batch of House Republicans wish they could do – it’s not possible to repeal this law. This is the 39th and 40th times the Republicans have wasted staff and public resources to demonize a program that is currently showing benefits of streamlining healthcare delivery and expanding assistance to those previously disenfranchised from affording benefits. Albert Einstein defined insanity as doing the same thing over and over again and expecting a different result. Republicans are acting like spoiled children who didn’t get their way – walking around grousing and kicking the carpet, only to go and ask the other parent if they can have their way. 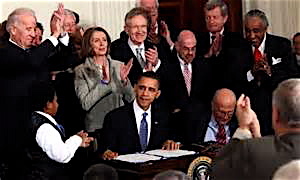 Medicare Part D, or the Medicare prescription drug benefit, that President George W. Bush proposed, was not exactly popular with Democrats, but once it narrowly passed Congress in 2003, both parties got behind it to make its implementation as seamless as possible. Today, you couldn’t pry that benefit away from seniors. And the funny thing is, that program was completely funded through deficit spending. Regardless of Medicare Part D’s success, essentially China wrote America a check to pay for it. Meanwhile, the Affordable Care Act is paid for, but Republicans continue to cry over their spilt milk, so they are refusing of allocate reasonable funds to assist in this new law’s implementation – even though it’s happening anyway. Fear is a powerful motivator for Republicans. It’s unprecedented the level of feet dragging and obstructionism that Republicans are exercising over a law that has passed. It’s particularly disturbing to watch the majority of Republican governors purposely harming their respective citizens by not opting for expanded Medicaid or setting up health benefit exchanges, where residents and small businesses can turn to qualify for premium supported health benefits and tax breaks. It will be up to residents in these states to hold their so-called leaders to task for such reprehensible decision-making. The Obama administration isn’t waiting for the GOP to see the light. They opted to go on offense in July to push back against naysayers of the Affordable Care Act. The day after House Republicans passed legislation to delay enforcement of the employer and individual mandates by one year, which have no chance of getting through the Senate, President Obama announced that checks are in the mail for 8.5 million Americans who will split more than $504 million in rebates from their health insurance companies. This comes courtesy of a provision called the “80/20 rule” in the health law that penalizes insurers for wasteful spending. It requires insurance companies to spend at least 80 cents of every dollar in premiums collected on patient care and quality improvement, and no more than 20 cents on administrative costs and overhead. If they spend an excessive amount on profits and red tape, they owe rebates back for the difference no later than August 1, 2013. Locally, more than 200,000 Kentuckians will be getting rebates from their health insurance companies this summer, averaging $100 per family. U.S. Health and Human Services Secretary Kathleen Sebelius said 206,771 Kentucky residents will receive $14,405,533 in rebates because of the Affordable Care Act. Last year, nearly 13 million people split $1.1 billion in rebates based on their 2011 premiums. The administration is also encouraged by preliminary data that suggests premiums will be lower for individuals who must purchase coverage through the exchanges, due to greater competition amongst insurance companies. A new analysis by the Obama administration found that in 11 states where data is available, the lowest cost “silver” plan – which covers 70 percent of medical costs – will cost on average 18 percent less than the Congressional Budget Office estimated. The Affordable Care Act’s positive impacts continue to spread since it was passed three years ago. 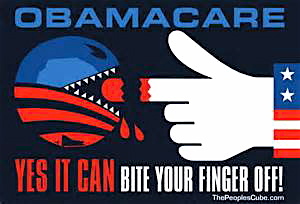 It’s not that there will not be bumps in the road as an estimated 30 million Americans who currently lack health insurance begin signing up on October 1, but for those that wish to disrupt, defund or dismantle Obamacare, without base or fact, purely due to fear or racism, I kindly say step aside. Stop hurting others for the purpose of political aggrandizement. All of these Republican politicians have some of the best healthcare benefits available, allowing them the luxury of telling the disadvantaged about how awful Obamacare will be, and yet, the GOP continues to offer no legitimate healthcare reform alternative, only scorn and narcissism. Just step aside Mr. Speaker, Mr. Majority Leader, Mr. Senate Minority Leader, and let true change walk past. This entry was posted in News and tagged Affordable Care Act, Barack Obama, Obamacare. Bookmark the permalink.